Today's Let's Talk iPhone event wasn't all about the iPhone after all with Apple dropping the price of the Multi-Touch iPod Nano down to $129 for the 8GB model and $149 for the 16GB model. Apple hasn't changed the overall design of the Nano, but it did get rid of that quad-icon grid interface for a sleeker larger single icon interface. Also, a built-in accelerometer will replace the Nike shoe sensor for keeping track of how much calories you've burnt, distance, number of steps and time. The new iPod Nano now comes with a slew of 16 new clock faces that will make wearing your new iWatch that much more better. It seems Apple has brought back the faith in the dying wrist watch accessories for its little touchscreen enabled iPod Nano. Current iPod Nano 6G owners can now download the 1.2 software update in iTunes starting today adding the new user interface together with the 16 new clock faces, so get downloading! 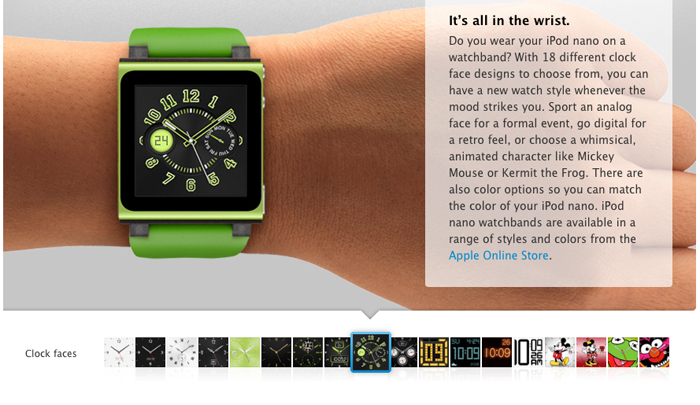 The updated iPod Nano is now shipping at full blast.